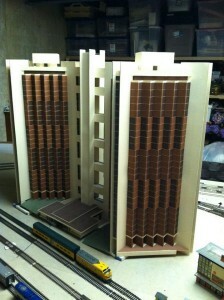 Watterson Towers, left, and its model replica. Watterson Towers holds a special place in Jim Sheldon’s heart. And in his basement. That’s where you can find a stunningly accurate 1:87 scale model of the 28-story Illinois State residence hall. The 1983 business information systems graduate built it over a slow winter in 1987-88, relying on his old photos, a few University publications he held onto, and his memory. The train-set model is built out of acid-free frame matting material, recreating the stacked rectangular blocks that give Watterson its shape. But there were a few features that Sheldon was having trouble crafting – the soffit over the Informal Lounge windows, the huge blocks on the top of each tower, the intricacies of the lobby. 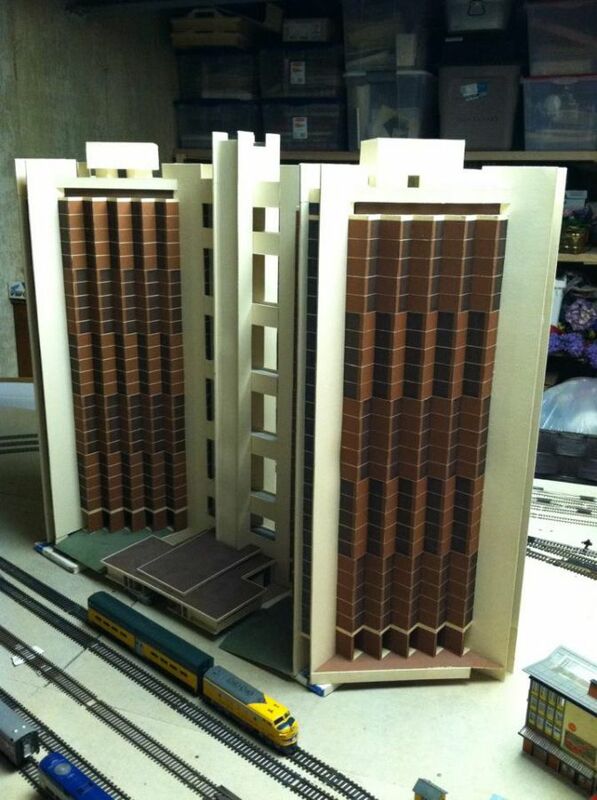 Jim Sheldon’s Watterson Towers model. Click for large version. “Finally, there was one time in particular (during building the model) when I needed to drive to Normal and walk around to capture the correct dimensions,” Sheldon said. Sheldon and his model will be back on campus Friday, for an event commemorating the end of a two-year renovation of the 44-year-old Watterson. Along with a complete gutting and remodeling of the bathrooms, repairs were made to the exterior of the building and a number of improvements were made in common areas. Amenities to rooms were added, including wireless Internet access and overhead lighting in each room. New furniture now graces each floor as well as a fresh coat of paint. Sheldon first saw Watterson in 1976 while on campus for the Illinois High School Theatre Festival. He spent more than two years in Watterson, first in Adams, later as a resident assistant (RA) in Van Buren. The stories flow easy for Sheldon – the pillow fight that sprayed feathers all over the carpet, the double-cheeseburger nights downstairs, the time when he and the other RAs tracked down the culprit who threw stacks of computer punch cards out his window but forgot to remove the bright-green ID cards first. 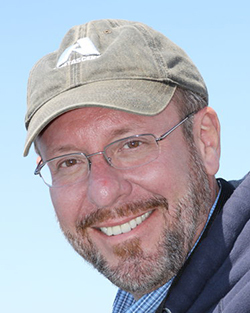 Jim Sheldon, 1983 business information systems graduate. Watterson’s greatest feat, however, was its ability to be huge and small at the same time, he said. Sheldon was living with 2,200 people in Watterson, but the 24-person suites kept it from becoming overwhelming. “It was the accountability, the intimacy, the chance to become closer friends with just a few people,” he said. Sheldon saw Watterson again back around 2000, and “it looked kind of crumbly,” he said. But he was impressed last month when his family took the train down to Uptown Normal and spent the night at the Marriott Hotel, only to open the window in their room and see the newly renovated Watterson – returned to its glory days. “So I had to go over and check it out,” he said.